I think I'll be adding a new category of California things to write about...and that would be "It's the Little Things." I have found in my California travels that, truly, it's the little things that catch my attention, make me smile, and mean so much. One such "little thing" happen ed while on the road with the Amgen Tour of California. Driving hundreds of miles was easy enough, but each day's weather was always in question and sometimes affected travel times. We experienced the best of California's sunshine and blue skies, along with some BIG winds and rain. I had to smile. And the thought once again resinated through my head, "It's the little things..." Thank you Wine Valley Inn!" If you're looking for the best of all possible retreats during California's wildflower season, think Wilbur Hot Springs. Off road, off the grid, outta sight and (nearly) outta mind. Bear Valley Road, the dusty and magical trail that leads to Wilbur Hot Springs, provides spectacular displays of California wildflowers. Once you make the turn off Highway 20, you'll know you've stumbled upon something special. More than 16,000 acres of open space are protected by the American Land Conservancy around Colusa County's Bear Valley. In spring, California wildflowers grow in profusion California wildflowers grow in profusion in this most blessed region of California's Central Valley, internationally known for the quantity and diversity of its blooms. Orange poppies, yellow tidytips, purple lupine, owl's clover, and rare adobe lilies are just some of the wildflower delights. And birders...well, you won't be forgotten throughout the spring and the other three seasons! Recent sightings include: bald eagles, great blue heron, pileated woodpeckers, belted kingfishers, gold finches, blue birds, and a variety of hawks including red tails, northern harriers, and American kestrals. You will leave a world of cares behind when you make this trek to Wilbur Hot Springs and Bear Valley. I will be able to tell you the "Rest of the Story" when this open-space, back-road wanderer makes the journey in late April to witness all these natural wonders. What a life! 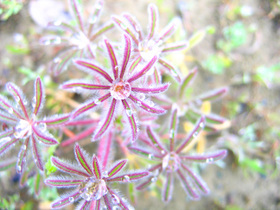 Springtime in California has turned the verdant Sutter Buttes hillsides into a colorful, shimmering wildflower garden. Bring your lunch, water, and camera and view this seasonal wonder. Prepare for some moderate climbing and uneven ground. This is rated a 2-book hike by Middle Mountain standards. The check-in time is by 8:00am; return time will be about 3:30pm. Pre-registration is required. The details will be sent upon registration. 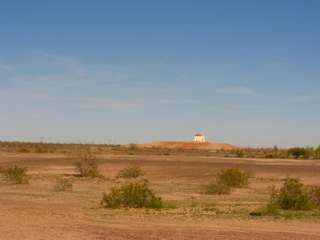 The Sutter Buttes are the smallest mountain range in the world -- the highest peak is 2,117 feet above sea level. Tours of the Sutter Buttes are by reservation only through the Middle Mountain Foundation. Take advantage of this amazing trip! Located near Yuba City, it's an easy drive from Sacramento and many other Central Valley locations. The cost is $35 per person. The Middle Mountain Foundation pays the private landowners and the guides, and carries the liability insurance. Act quickly for this added opportunity! Karen Morrison will be able to answer emails and telephone calls on Sunday late morning and then Monday and through the week. She will answer calls or email in the order received. Once I got my rental car on the road, I was glad the Interstate was so quickly accessible. Traffic was heavy, but I kept my eyes on the eastern horizon with dreams of open spaces. The urban landscape quickly gave way to more rural environments. And slowly...slowly...the beaches and flat of San Diego began to climb to hills and valleys of places like Alpine and the Cleveland National Forest. It's amazing how quickly the topography changes...and amazingly different. Because I was behind the wheel and there was a bit of a wind, I couldn't really let my eyes wander too much. This is when I wish for companions to share the load of driving. But then I began to see wildflowers....ohhhh, I wanted to pull over and stop but Felicity was waiting -- the Official Center of the World is waiting. I was looking for exits that I'd want to access on my return journey, but other then that I just stayed on course. The hills were green; then rocky and more the appearance of high desert. And suddenly there are dunes and then boulders and rock towers -- rock jocks would love this place. Again, hard to imagine that San Diego beaches are less than one hundred miles away. I did take one detour looking for food and found myself in Jacumba -- a stop on my return trip at Jacumba Hot Springs -- and wonderful Old Highway 80. I so desperately wanted to drive the quiet back roads, but I knew this would delay my arrival at Felicity. So these wonderful "country" roads will be my reward on the way back. I am serious about driving and have driven many, many miles on my own. But this trip -- less than 175 miles one way -- seemed endless. Perhaps my anticipation of the long-awaited Center of the World. 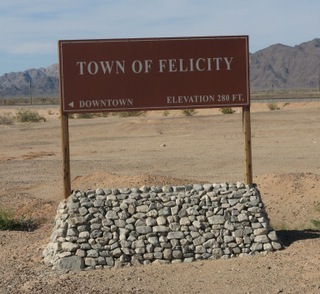 Now you may be asking yourself, "How did anyone decide that Felicity, California is the "official' Center of the World?" I can't say with certainty, but here's the short version. An interesting Frenchman, Jacques-Andre Istel, acquired the lands currently known as the town of Felicity -- the name honors his wife, Felicia. In 1985, Monsieur Istel wrote a children's book, "Coe, the Good Dragon at the Center of the World," which places the world's center at Felicity. This was officially recognized by the Imperial County Board of Supervisors and, in 1989, the law was recognized by the Institut Geographique National of the Government of France. Sounds pretty official to me. Besides, it's such a lovely story...why not have the Center of the World in California? Suddenly, when I think I just can't take one more mile...off in the distance I see it!! The Hill of Prayer! I don't know how many miles away, but the desert is so flat there was no mistaking the image. "OMG!" I gasped to my lone self, "There it is!" And 18 years of waiting have come to fruition. But more adventures were still ahead. On the morning of my departure (3-07-08) to California's "Center of the World" I was excited! Getting to the Center of the World is pretty easy. Fly to San Diego, pick-up the Enterprise rental car, and drive approximately 170 miles to Felicity, California. Straight shot! The bags were packed and I seemed to have remembered all the smallest details; binoculars, walking stick, camera, batteries, maps, and rocks (that's another story)! As usual, I'm up and ready to go in plenty of time and my friend Samara, who has generously agreed to drive me to the airport, shows up exactly on time. And so we're off! I've already printed my boarding pass, so it's just a matter of checking my bag when I get to the airport. Terminal A at Sacramento Airport seems strangely quiet for a Friday morning. There's no one in line at the Southwest counter and I'm checked-in and on my way upstairs in record time. Shoes off, laptop in the tray, jacket, cell phone, carry-on bag...check my pockets, "Yep!" All clear. My carry-on goes through the x-ray and I see a puzzled look come over the security guy's face. They back-up the belt...."Oh, looks like an apple." I hear him say. I smile. "No, a delicious pear! A real chin dribbler!" They laugh and I hear them say, "We like her! What was that you called it again?" I feel good thinking that something so simple as "chin dribbler" brought a little cheer. Should be a good day. I get up to my gate...now I see why the terminal was so empty...everyone's already upstairs. It's packed! I decide to take a photo of the gate information -- might as well document the full adventure. But GASP my camera isn't working. This can't be! I planned. I keep trying but nothing happens. I put in fresh batteries this morning...let me find the extra pair. I walk away and am searching when suddenly the airport policewoman is at my side. "Can I see your camera?" she asks. "You know you're not suppose to take photos in the airport?" I am stunned! No one has ever mentioned this before. And in the world of airport security, it seems a bit odd. But I smile and show her the camera and explain why I am taking photos...or in this case, not taking photos. She's very friendly and once I explain she lets me proceed. The flight boards and departs right on time. Lucky me, I'm in the first 25 -- it's a pretty full flight. As always I'm praying for smooth sailing, since I'm not the world's best when it comes to flying. The skies are pretty clear and few wispy clouds. In no time we're far and away from Sacramento and the vast expanses of California stretched out below. It's spectacular and green. 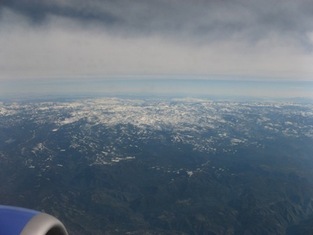 Soon the still snowy Sierra Nevada are on the left -- I specifically chose this side of the plane. High peaks and deep valleys all draped in white. The flight is a little less than smooth, but it's not much more than hour to San Diego. And the sight of the coastline brings a huge smile and the idea that we'll soon be on the ground eases my nerves. And besides, the Center of the World is just that much closer. 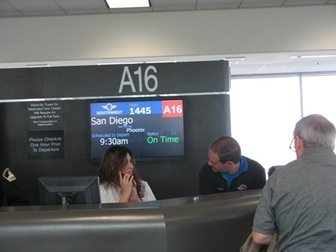 At San Diego, I grab my bag, a cup of coffee, and hop onto the packed Enterprise shuttle. The rental location is seriously under construction. But to make-up for any inconvenience, they've got tons of smiling staffers to speed the rental process along. And, bottles of water at the door. Thank you! I need this! I get my paperwork in minutes and am out in the parking lot with Trevor who is showing me my Nissan Versa. I have no idea what this is, but it's an upgrade from my requested "economy" car, which is not available. No problem. I got a killer deal on this rental. I booked it pretty far in advance. Trevor is really thorough and makes note of all the little dings and dents...much appreciated by me. We chat a bit about California; he's originally from Corona. I tell him I'm going to the Center of the World, in the far southeastern corner of California. He's very interested and I explain the purpose of my adventure and how I've waited nearly 18 years. He says he'd like to know more, so I direct him to the blog and he thanks me. Finally, after exchanging some more stories and a couple of friendly handshakes, I pile into the Nissan and get myself out of the airport and onto Interstate 8 east and almost immediately I see signs that say Yuma, 171 miles. And now...really now...I am on my way to Felicity, California...the Center of the World! Nearly 18 years ago I went to work at the California Office of Tourism and began a love affair with California. Lots of interesting people would call with all kinds of issues, but one such memorable call came from a gentleman by the name of Jacques-Andre Istel. Mr. Istel was calling, upset, that the new California state map DID NOT include his town of Felicity, California! Felicity....the recognized "Center of the World!" Now I was new to my job and really didn't know what to make of this. Mr. Istel wanted to speak to our Director because, as Mayor of Felicity, he intended to have this grievous wrong righted. So I'm thinking this is the craziest thing I have ever heard. I don't recall much more than that, but I can tell you that Felicity, California -- Center of the World -- has been on the official California state map ever since. What I can also tell you is that I never forgot the conversation. And ever since that day, I have been waiting to visit Felicity. That was in 1990. I never spoke with Mr. Istel again until 2007. I was heading for southern California and hoping to visit Felicity, the Center of the World. I had no real idea about the location, but Mr. Istel quickly told me that by late March it's pretty hot in the southeastern corner of California and they leave for cooler locales. He said they would return around Thanksgiving and I could visit after that. OR, he went on to tell me, they would be dedicating the Hill of Prayer on March 7, 2008 and that would be an exciting time to visit. I told him then, "I will be there!" Today is March 7, 2008...I have arrived in Felicity!